As Interactive Displays Manager, my specialism is encouraging people to engage actively in the galleries. I try to involve real objects in this as much as possible, but it’s not often I get the opportunity to present an authentic cultural object designed specifically to be interacted with. That’s why the prayer wheel house in the Living Lands gallery is my favourite object in the new galleries. 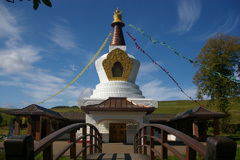 When I began working on these galleries in 2007, curators in the department of World Cultures had already agreed with the Samye Ling Buddhist Centre in the Scottish Borders that they would create an authentic Tibetan Buddhist Prayer Wheel for us which visitors would be able to interact with. 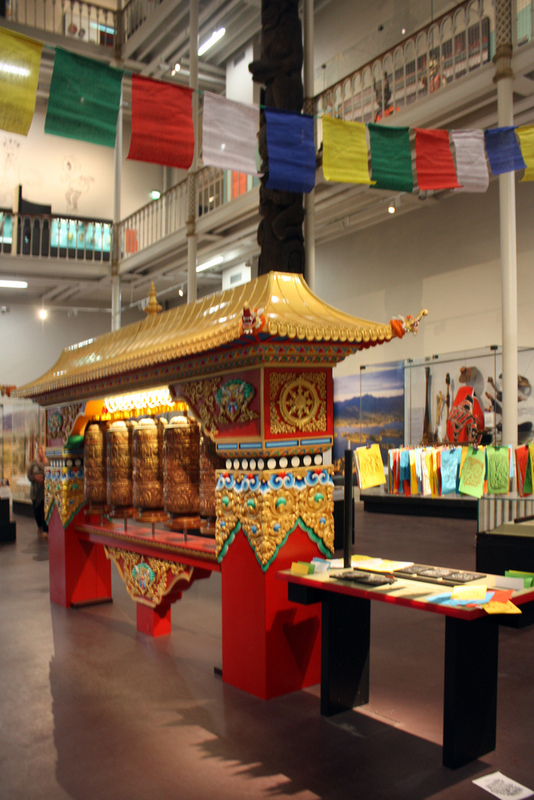 At first, we envisaged this as a single large prayer wheel, however, the Living Lands gallery is a ground floor space which has two balcony galleries on the floors above and therefore no ceiling as such. Even the lowest balcony is around 6m from the floor level. Because of this, we were unable to anchor the wheel at the top without building a self-supporting ‘house’. 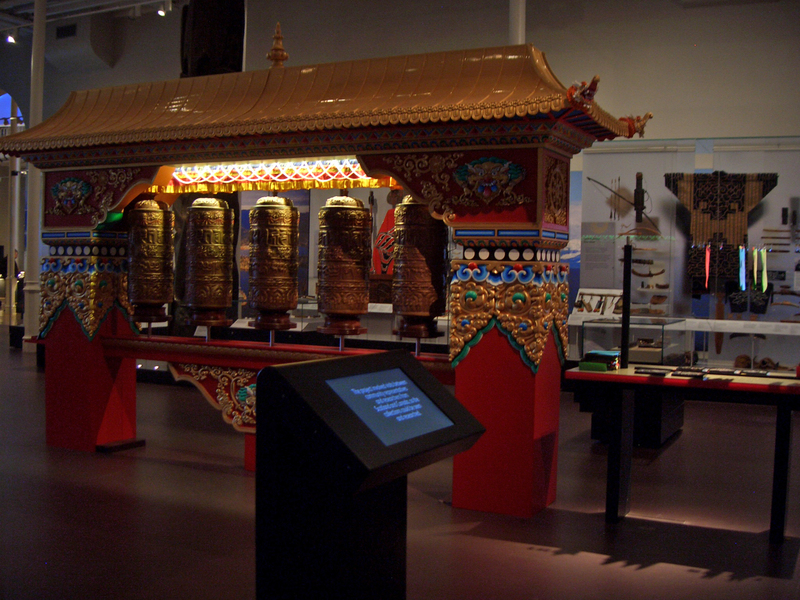 As we worked with the designers, Ralph Appelbaum Associates, on the gallery layout and visitor flow, we realised that a house for a single large prayer wheel would become enormous due to the circulation space we’d need between the wheel and the corner supports for the structure and would dominate the gallery disproportionately (The Tibetan section is only one-quarter of this gallery). 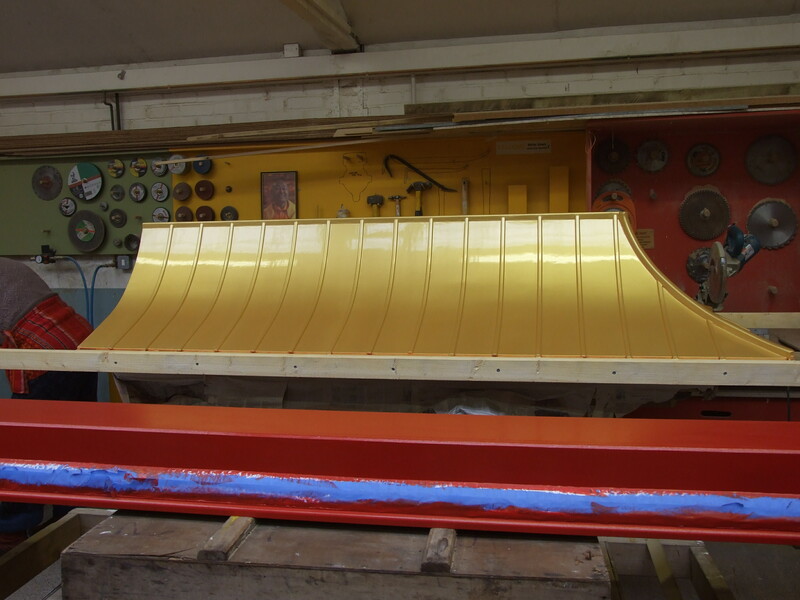 So, we went back to the drawing board and studied the range of Tibetan prayer wheels. 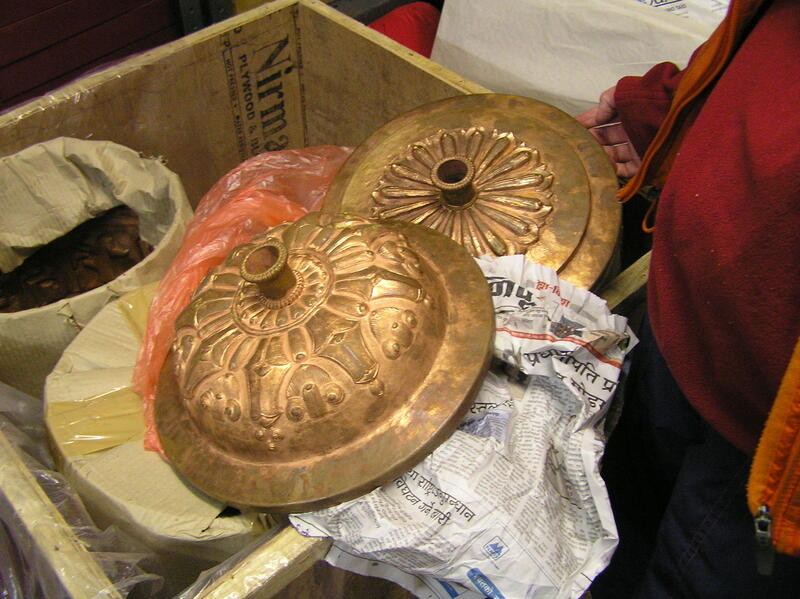 We began investigating rows of smaller prayer wheels which are often found set into walls. 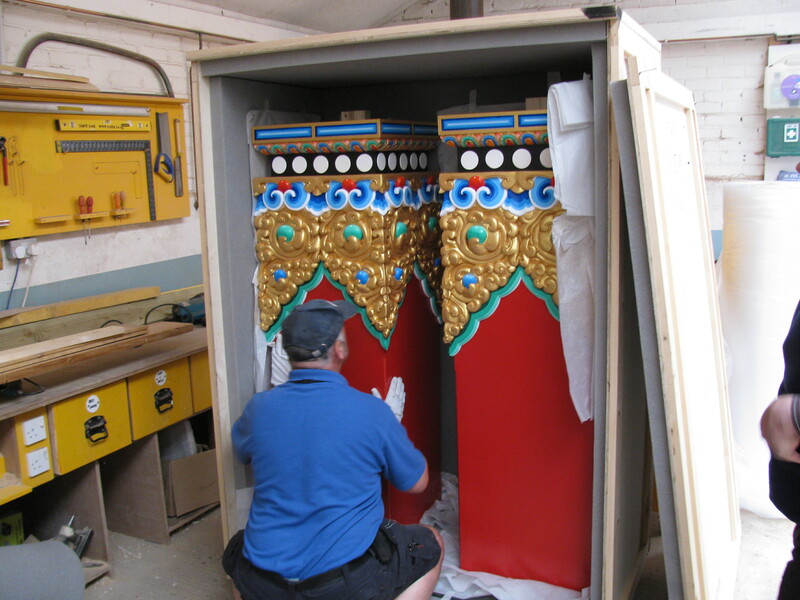 In fact, there are long rows of prayer wheels in the prayer wheel house at Samye Ling which surrounds the main Stupa there. 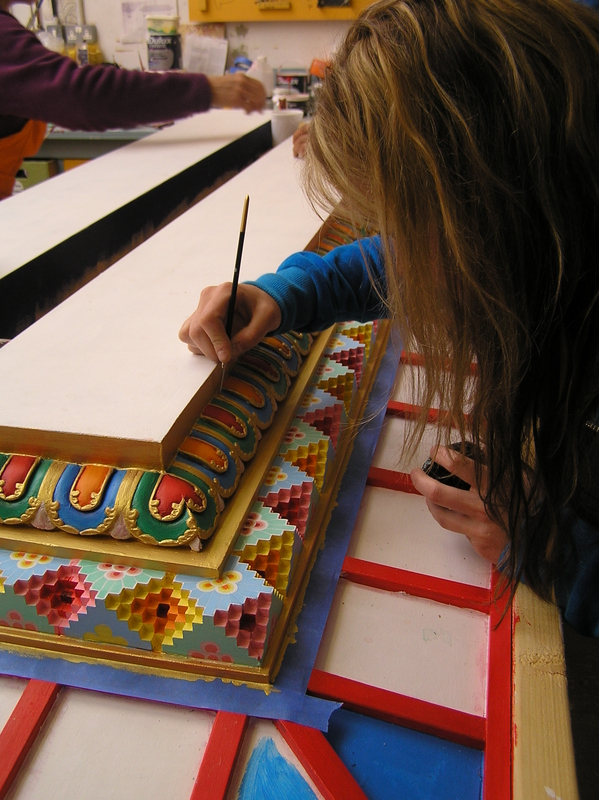 Our project manager from Samye Ling, Yeshe Palmo, then came to us with a sketch for how our prayer wheel house might look: Work began at Samye Ling in early 2009, with the structure first. 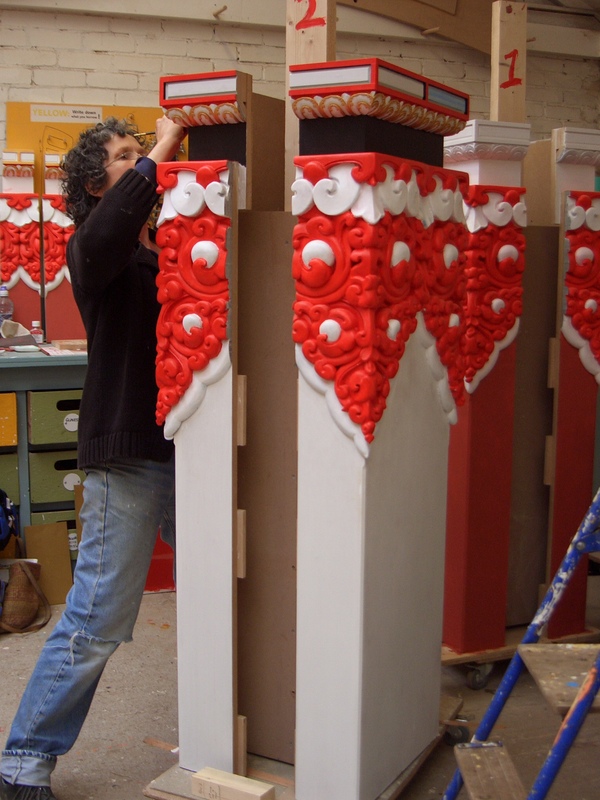 This was to be made in wood and plaster then the roof is built up in layers of lacquer before the details are hand painted. Meanwhile, the wheels themselves were ordered from Nepal. 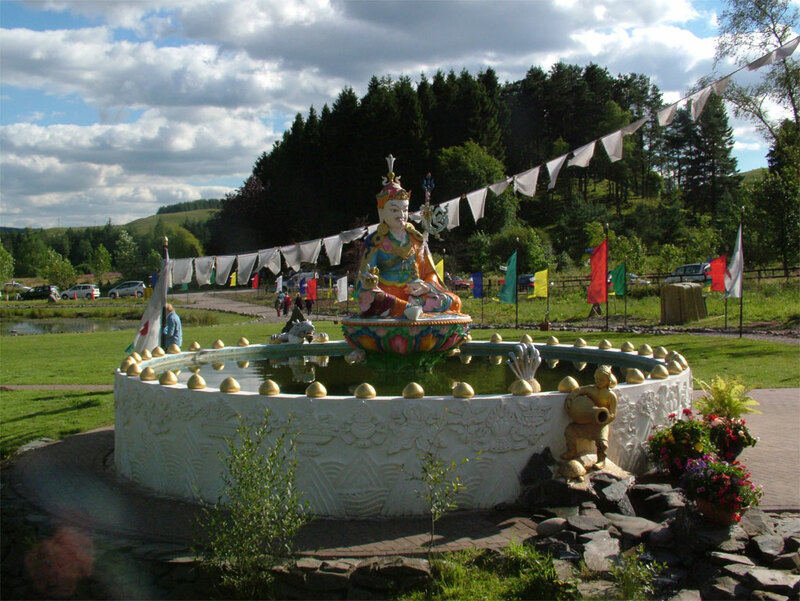 My first visit to Samye Ling was in May 2009. 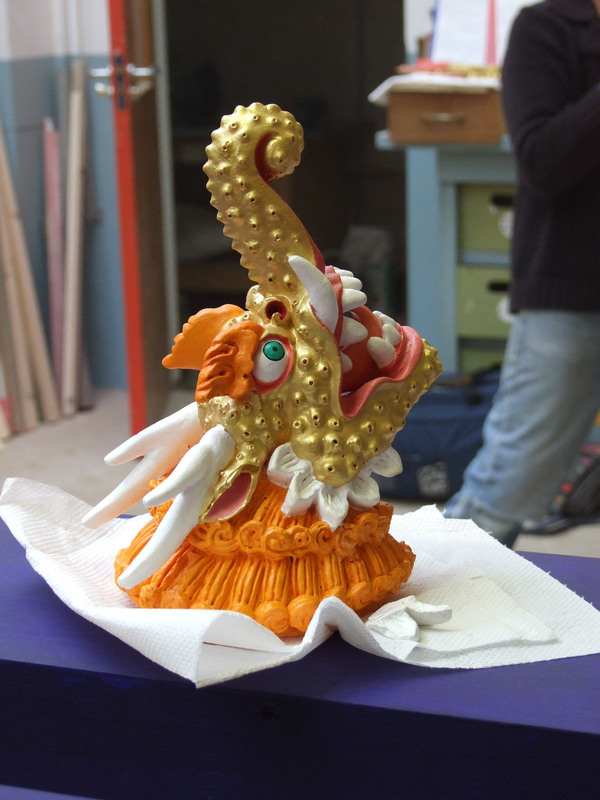 I went down with one of our assistant curators to see the work in progress and also to accompany our film-maker, Sitar Rose, who we had commissioned to produce a film about the process and about the meaning of prayer wheels for display on the gallery. 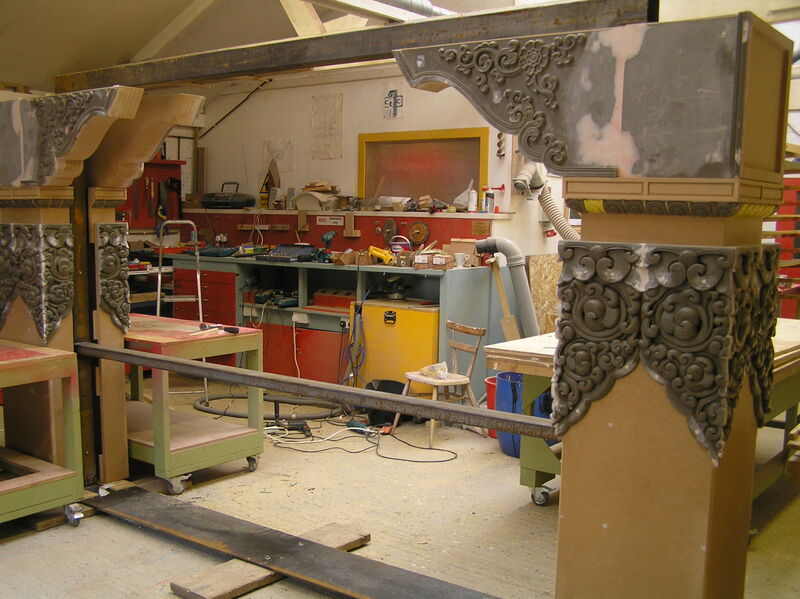 Before this project, I had never heard of Samye Ling, and even once I had it described to me I found it hard to imagine. The journey took us south from Edinburgh for nearly 60 miles, the majority of which on single-track roads through some of the most beautiful and remote land in the Scottish Borders. 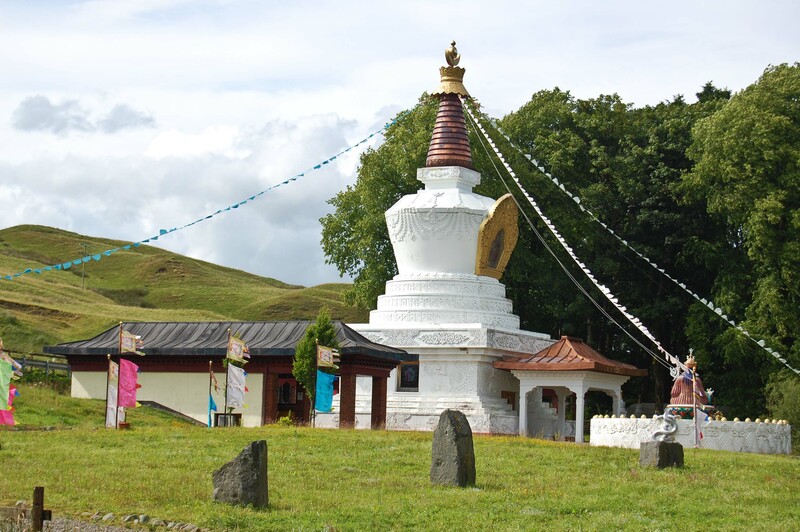 After driving for nearly two hours, the first sight of Samye Ling is quite surreal, it’s like a little bit of the Himalayas dropped into Scotland. I was lucky enough that first day that the sky was bright blue and the sun was shining, instantly transporting me back to time I spent travelling in Sikkim in the Himalayas. 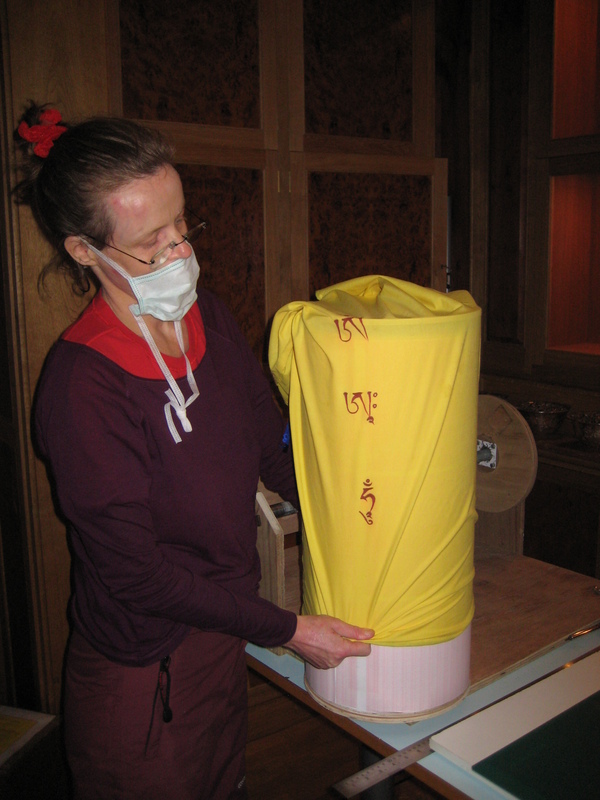 Now, to the important part – prayer wheels contain millions of printed mantras (short prayers) on rolls of paper which have been inscribed on paper soaked in saffron water and blessed in a special way. As you turn the prayer wheel clockwise it activates the blessing of the mantras, transmitting the energy of peace and compassion in all directions. 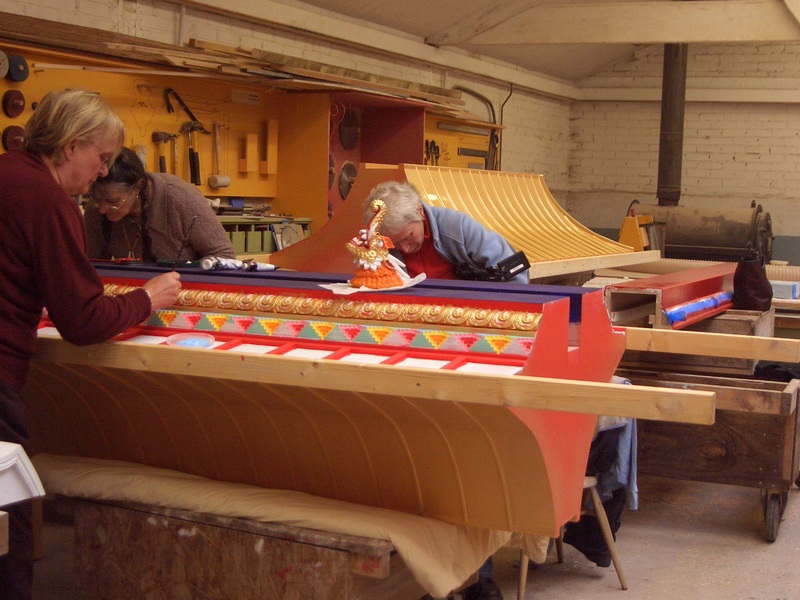 The blessing process happened in November 2009 and was filmed by Sitar and photographed. 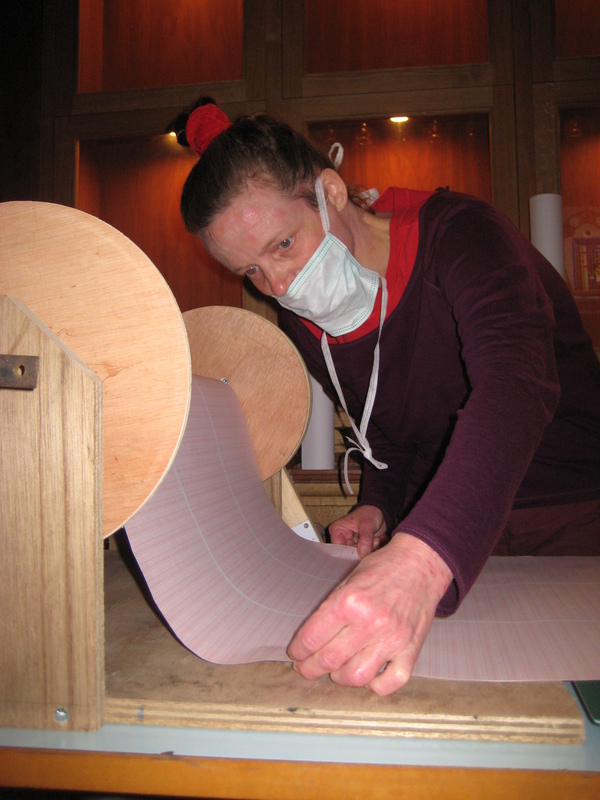 This was very important to us as most people have no idea what is in a prayer wheel or what goes into making one. The blessed mantras inside the wheels from Nepal were then stored in a sacred place in the temple at Samye Ling until it was time to put the whole thing together in the gallery where it is displayed alongside an interactive where children can create their own prayer flags and also the film that shows the process of making the prayer wheels and has interviews with people from Samye Ling about the meaning of the mantras.